Lake Hillier is a pink-colored saline lake on Middle Island in Western Australia which is the largest island in the archipelago, south of Western Australia. This lake is about 600 meters in length by about 250 meters in width. It is surrounded by a rim of sand, dense woodland of eucalyptus trees and has the ocean on its northern part. The lake gets its pink color from organisms that produce a pink color dye or the red halophilic bacteria which is found in its salt crust. 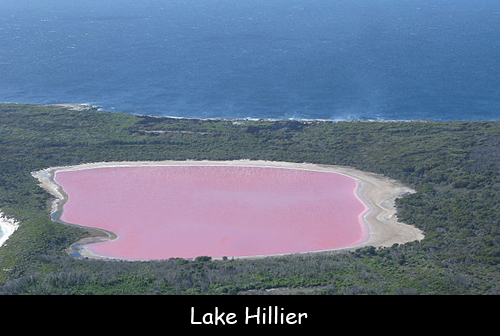 In the early 1900s, for six years Lake Hillier was used for salt mining but now it is only for tourist visits. This lake was first discovered by navigator and cartographer Matthew Flinders in 1802. He took samples and mentioned its existence. This Lake was named after William Hillier, a Member of the Investigator Crew but he passed away before their departure. It has a high level of salt content but it is safe to swim in the lake because it is not a toxic substance. Apart from some micro-organism, no other living things are present in the lake. If you take the water from this lake and place it in a container then it will still look pink. The lake is separated from the ocean only by a thin band of trees. As the location is surrounded by a thick covering of forest it is difficult to be travel via land. Helicopters and cruises are the only options to reach there. The lake has a total surface area of 1.5 hectares (3.7 acres). It is is about 10 times saltier than the ocean and is rimmed in a salty crust. It is not the only pink lake in the world and not even the only pink lake in Australia.